Bengals Need Help. I Need You Now. 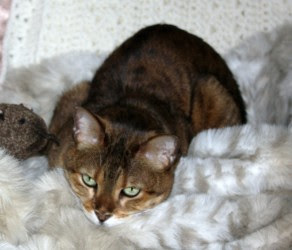 For those of you new to this blog, I work saving Bengal Cats with Great Lakes Bengal Rescue. If they cross my path, I will save them. And we need help. It was a breeder in Indiana, whose home was foreclosed on. We took all 12 cats out of the place, and all are sick. We have found foster homes for all 12, and all are social, and will find homes. But unfortunately, before they do they need medical care, and spay/neutering, and shots. That won't just stretch us, it will break us. Just found out yesterday that a breeder in IN was having her house foreclosedand had to be out by Thursday and had 12 cats needing rescue. One of ourfosters was able to pick them all up today and we found foster homes for all ofthem. They are all sick with upper respiratory infections, underweight, and all12 will need spayed/neutered and there are more girls (more expensive) thanboys. They will all need tested for FELV/FIV, rabies shots, wormed, ear mitetreated, and then when healthy spayed/neutered. Then they will go up foradoption. They are being fostered in IL, near Rockford and Chicago burbs. Also, took in a sick one from a WI shelter that would not have adopted her outas she has a polyp in her ear that needs treated. Surgery might be $1200 butwithout it she will continue to have sinus and respiratory infections. 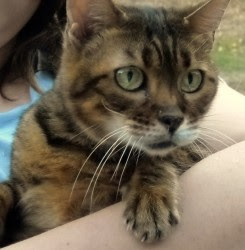 I don't have pictures of the new Bengals, as of yet, the ones here today are ones currently available for adoption. I'm not sure I could see pictures of the new Bengals without crying. Janet told me this morning that one is only 3.5 pounds, and all are underweight. All are very young. One has a permanent head tilt from an ear infection that was never treated as a kitten, and will always be a special needs kitty. I am not too proud to beg for them.This is going to run into thousands of dollars, already has. I won't deny that I spent a few minutes this morning with tears, and if I could ever get my hands on the people who take in and breed these cats without the slightest understanding of what they need, (or in this case, apparently, the slightest understanding of basic cat care), I would indeed smite them. But that won't help the Bengals now. As always, I am still offering "Any Amount, Any cd's" if you would like something in return, send ANY amount, let me know and I will gladly send you a cd or two of mine. I have both Folk UnderGround and Lorraine a Malena. I have a few Flash Girls yet, but those would be very expensive. Impress me. A lot. And I will send you one. But I will save them. I will, of course, do what I can. Hi Lorraine, I sent something that I hope will help a little. Any amount helps. Anything. The poor scared kitties. Donated (before even reading completely the post). PayPal and I are on the outs, check is going in the mail today. Donation done! If you send a CD, I already have Folk Underground (and the t-shirt) :-) . Poor kitties. This is so unfair. out here in the los angeles morning, having tears with my coffee. i will send help. love and miss you, miss Q.
you are doing beautiful work. I thought you would all like to know I have three of these cats in foster. All were hospitalised yesterday, as I took two year old Stormy weighing just 4.7lbs out of the carrier the vet nurse burst into tears and kept saying.. oh my god, oh my god. Crossie who will be renamed Cassie is two and a half and weighs only 5.3lbs. Aphrodite is just over a year old and weighs just 3.5lbs, we are renaming her Peanut which is the nurses name for her.. little peanut. They are fighters. They were all force fed yesterday but today they are ALL eating. They are the sweetest and most loving cats I have ever met, especially little Peanut. I will get photos to you later Lorraine. Oh and.. may God or whatever Deity you believe in bless all of you abundantly for your help. Poor kitties. It sounds as though they will be better away from such a breeder. Where/how do you get them spayed and neutered? And dewormed and shots and demited and all? This is in Noblesville, IN. A female cat costs $27/spay, here. And a male $22. A full package of vaccines is $34/cat. And capstar is $3/cat. I have been here with a few of my cats, and my mom has taken dogs here. They are a wonderful place and everyone is superbly nice. I'm not sure if this will save you money or not, but it is definitely an option. Especially since the cats are from Indiana. I donated $50 - all I can afford at the moment. I'll send more on the first. Poor things. I just had to put one of my cats down in December it's in his honor. Shared the link and made a small donation. As a kitty foster parent, I know just how much work and dedication it takes to help animals in need. A reminder to readers- $5 doesn't seem like much, but it can add up quickly. You going without Starbucks a few days can help keep a kitty healthy and safe. I somehow got 3 posts behind! As soon as I'm on a computer and not my phone, I'll paypal to GLBR. What is wrong with people!?!? Well said Clara, thank you all for donating.. you are amazing. Maura.. you touched my heart. Would you like me to rename Stormy our smoke cat Alexa to honor your little guy? Caylor thank you but all the foster homes that took in the cats are in Illinois so it is too far for us. And too far for them. Look for photos later, we will make sure they get to Lorraine. Lorraine.. we don't talk often.. but you are a STAR. Shanta - totally up to you :) I'd be trying to adopt one other than the fact I'm full up with 6 cats still. I just can't understand animal neglect and it makes me so angry and upset. Thank you so much for taking them in and nursing them. It's a big job but nothing beats seeing them making strides to recovery and I was thrilled to see they were all eating unassisted today. That's a great sign. I fear I'd cry at the sight of little Peanut. Here's to loving care and medical help and them getting happy and healthy then finding a forever home that will spoil and love them. That's very unsettling, but you tell the truth like no one else can and I think you'll get help for these cats. I will be donating on Monday, even though it's a few days away. 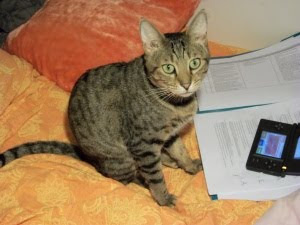 How is rescue cat Bengal Romeo? Donation sent. I'd love a CD if there are enough to go around....but thinking of the cats eating and purring is a pretty good reward. so. i just sent the last of my monies unfortunately to bills. i posted it on facebook for starters. my heart goes out to those poor kitties. i wish i was closer so i could help with more than just my wallet. Oh god this wa bad timing. I'm angry and in tears because my neighbor has just said on FB that she is getting her beautiful cat put down in less than an hour, all because quite frankly she's too lazy to organise getting her rehomed. I am FURIOUS. And then I read about these poor babies. I have to go and cry now. I rang a friend who I thought might take her, all to no avail. I'm trying to feel like I haven't failed. All I can say to you is: THANK YOU. The love is SO much, it makes me weak, your caring, means SO much to me. And to the Bengals you are saving. Unfortunately I must tell you EG Bengal King Lear the Huge is going to have to die. He ate, CHOMPED on really, my Naptown Roller Girls Calendar in the night. I am going to THROTTLE him. December? Really? Why December???? Perhaps yopu can get them to send you another calander, and stop the cost out of Lear's food bill? Oh, I'll get another calendar, need a few anyway. But it's the principal of the thing. One pets simply cannot chomp on ones Derby Girls. Must be a jealous reaction by Lear, more attention on calendar by you than on him. Update on 12 sick cats. The 3 in the hospital were able to be released last night with continued care in foster home. All have been to Vet now, all on medicines and all are so skinny. The largest is 6 pounds at almost 3 years the smalles adult is only 3.7 pounds. Thank you so much all of you for helping. Bill for 3 of them was $640 and they will still all need spay/neuter, shots. But donations will pay the majority! But that just means he finds them tasty too! The boy has great taste. BengalGirl - thanks so much for the update. It's a great step that they are eating and could be released. I'll be looking forward to updates showing their fattening up. Poor babies sure need it. If you have any Folk Underground left, I would like one. THANK YOU everyone donating. You are truly, really, madly and deeply, saving us here. If they cross our path, we will save them. And that is making a difference. If you wanted a cd, you need to email me this request, with your address tho..
Posted a link to this on my FaceBook page. What the hell is wrong with people?? Poor pretty Bengals. I'm crying just thinking about it. One of my Bengals, Argo, was a rescue from a breeder. The poor thing was scared of his shadow and skinny beyond belief. He's now as fat as Garfield...LOL. Of course, I will send money next week when I get a check. I'm sure you will need it just as much then as now. Just sent some money. Thanks for helping out these cute little (soon to be big) cats! Wow, how sad. I sent a small amount, sorry all I have, due to Neil's tweet. Thank him. Thank you. You don't have to send a thing but I'll publicize this on FB and Twitter ... you should get info out to the Naval Base - young sailors have big hearts. Although I could only donate a small amount, I send it with love for these precious cats in the hopes they are on the way to a life of good health and happiness. Small donations are every bit as welcome and needed as large ones, they add up VERY quickly. We are going to save them. Just sent my donation. Thank you for all you are doing for these sweet animals!! I have sent money in Canadian funds. I hope that is all right. Bless you for helping these cats. I'm getting ready to send you a little something. I'm afraid it won't be much. But I hope it helps build up the kitty for the kitties. Skint for a week or so, but will earmark a portion of incoming funds for this, and spread the word in the meantime. I posted to facebook on my leopard's behalf already. Funds from anywhere in the world work just fine, thank you!!! You make me weak, all of you. I may cry. Hi Lorraine. I'm here via a link on Neil Gaiman's twitter. Earlier this evening I was contemplating buying a pair of earrings online. I've decided to donate that money to help these kitties instead. It's not a lot, but hopefully it helps. It helps. More than you can know. Thank you! sent a bit. hope it helps. If you could get one to Boston, I would gladly adopt! That is not impossible you know...And thank you! I decided instead of wasting more $ on my FB game, I'd donate it to the kitties. Much better return on the investment. My reward will be the "after" pics. You are doing the angel's work, Lorraine. Donation send and I posted a link on Facebook. I made a donation through Paypal. Best of luck with these beautiful creatures. No need to send anything. The fact that you care enough about these cats is thanks enough! Done! I would spend that much on lattes in a week and my cat could use a new laser toy. I wish them all happy healthy homes. My constant and truest companion is a 6.5 year old purebred Bengal that my ex got for me from a breeder who didn't want to keep her because she was a runt and therefore too small to breed. I can't even bring myself to think about where she'd've wound up if her breeder had been less ethical. I don't have much money, but I've donated what I can spare and shared the link. Hope every little bit adds up to make a big difference. Thank you for opening your home to these guys. AGH. Cannot donate ANY cash - currently planning 2 fundraisers for myself due to breast cancer at 27 (double mastectomy, IVF, chemo, the works) with a $15K goal. BUT I have tons of yarn&time to knit, and a few beautiful self-made ceramics pieces, and if it will help I will gladly send some of these for you guys to sell. Because Keith Olbermann was fired from his show, I logged onto Twitter and there I read Neil's post about you. Just sent something small. Everyone, send something, even if it's small. It will add up fast. Thank you for saving their lives. Donation on the way from our 4 kitties. Saw a link on Twitter from Neil Gaiman, sent a small donation from UK. My 4 rescue snugglers say Hi :) They found a forever home thanx to folks like you HUGS! Small donation coming. Thank you for helping save these Bengals. Saw this on a retweeted retweet. I have a rescued Bengal and sent something along. Good morning from Sleepy Town fiends. Can I just say this one more time? You all so rock, and I am so beyond grateful. You reduced Janet, the Director, to tears last night, she was so happy. Lorraine's fiends are always generous when GLBR needs help but adding Boss's RT on Twitter has been icing and sprinkles on the cake. I have been very busy printing Paypal notices and sending thank you emails, with 60 of them coming directly from his RT. Thank you all very much, this will more than cover expenses with our 12 sick cats and give us a slush fund for the next time it is needed. Lorraine, you ROCK, thank you so much. oh that's fabulous to hear janet. i was worried about the large number of cats and not being able to raise enough money. my heart is warmed by knowing so many people came together for these cats. these cats crossed out paths and were saved. Sigh. If I didn't live so far away (Philadelphia), I'd take one, or two. I adore Bengals. I'm a bit late to the party - but some additional funds for the slush fund are welcome I'd guess - I sent my wee bit via paypal. I saw NG's retweet last nite while walking my doggies, then remembered to come here today to read your post about it all. I've enjoyed your blog for ages and it's about time I did more than lurk. I just can't understand people who take on these wonderful animals without any notion of how to care for them. 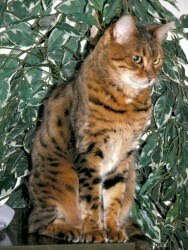 I have a Bengal that I got from a breeder who didn't seem to know what she was doing. Both of the parents had died and Kimba had to go into quarantine before she could come home! She is now nearly 4 years old, perfectly healthy and a wonderful character! I will send a donation via pay pal next week - well done to Lorraine and everyone else at GLBR, you are all STARS!!!! More funds are welcome for the slush YESYESYESYES!!!! This is not, sadly, an infrequent things that goes on.We are NEVER sitting pretty thinking "oh, what will we do with all this money??" On another note, the teacher picked me and another girl to jump on stage during the "Come along and dance" number in Zumba class today and do our dance and lead the class with her. Godddammm Rock Star I am, rocking some FIT!!!!! Just sent a small donation. Hope it helps. No need to send anything - save your bribes for someone else! Every dollar helps us. Too many, far too many people get these kitties and have NO CLUE what they are getting, and they end up in rescue. Wow, this is amazing! I always know the fiends will dig as deep as they can but getting Boss's followers involved...just...wow! I'd say more but i have a cold, can't stop coughing and everything's a little foggy. A check went out in the mail today. Sounds like the immediate rescue effort is doing fabulously well, so there will be funds for more rescues. Keep us posted - pictures of Bengals are always beautiful. Janet, that is fantastic to hear. Been meaning to do this for a while, really, and the timing just worked out well. What you guys do... I have no words, just love. I didn't see Boss's RT, (being on self-imposed Twitter Exile at the moment), but pleased to hear he's been using his powers for good once again. Wow, I've had a day away from the computer and come on to see how much response there has been! Well done Lorraine...and Boss. Kind of winter here. Still below zero, but I am going to see some Derby in La Crossee tonight, and I have coffee right NOW, so I'm thinking a good day. That's a grand sum! And I promised Janet some more next week (some people also mentioned sending in something at a later stage). Yep, more on the way from here. Will go out tomorrow. Am happy to hear that there'll be a slush fund! That's the hardest thing for small nonprofits like Janet's--having a big enough safety net ready for crises like this one. The slush fund for the next time almost NEVER happens. It does make breathing easier. Because there is going to be a next time, sadly. FYI, I mentioned you on my cheesy little blog award post. Because I think you're awesome. I hope the bengals got all the money they needed. Hi everyone! See what happens when you miss a day or two in the blogosphere? I've popped a check in the mail for the Bengal's slushfund...I love the way everyone here (and from Neil's twitter) steps right up! You are all pretty awesome! I'll second that, Shakatany. Erin's gave us the lowdown in an earlier thread, but I'm not sure everyone saw it. I sent a cat poem in. Someone else around here surely has a cat poem to contribute. A clicky link to her post. Erin did a really nice thing giving us that interview for The Night Garden Project, so I do not feel the least bit shy harping on about Poetry for Cats. Get writing, people. I want to add my thanks to everyone here for giving so much. I have been out on the Bengal forums telling the story and posting photos and all of us together have raised a fantastic sum of money. These little darlings deserve it. Stormy who might be Alexa, comes running every time I open the door and marvel such a tiny, skinny thing can look at me with such bright and keen eyes. And through her staunch efforts to breathe can still meow racously to get her nose wiped. Little Peanut our tilted head girl is a little afraid and will run. I make a point to catch her, cuddle her, and put a big plate of food in front of her so she realises she is very loved and can just work on getting better, and fat. Cassie is pretty laid back and doing very well. They are ALL eating me out of house and home, which is fine. THANK YOU all of you amazing people. Shanta - thanks for the update. They sound like they have a way to go but are fighters and determined. I laughed at the meowing from Stormy/Alexa - my Alex was a loud cat, too, and meowed in an annoyed tone when he wanted something. I'm glad to hear they are eating a ton! SO wonderful to hear!!!! Makes me so happy!!! I have big plans for a new post today, promise. I keep meaning to take a lot of new Bengal pictures and do a Bengal blog, but I come home too late and too tired to do more than crawl to bed, and it doesn't happen. SO, I'll take some pics and vid at the stable this morning.